Derek Armsden Design | "Can we have a logo with a map of Australia and our name around it?" This is easily the most common design brief given in this country. It’s a designer’s nightmare. A total cliché. People want to stress to the locals that they are local too, or they want people in other countries to be aware that they’re exotic. Either way, the unique shape of Australia is seen as a very useful visual shorthand by business owners and it’s hard to argue with them – except that it’s been overdone to buggery and surely there’s only so many ways you can do it and still be original. So yes I cringed. My mind wandered away and my interest level dropped as I wondered how best to frame the word “no” at them. “Are you open to other ideas?” I asked diplomatically. “Maybe” they replied. I had to admit it made perfect sense on every level in this case. 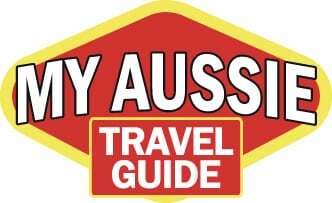 The name of the company is “My Aussie Travel Guide” and they produce audio book travelogues for people driving around Australia. Like, what else would actually work anyway? The heavy emphasis on the word “My” was very much part of the brief. The product is aimed at people who don’t want to follow established routes or organised tours. They may not necessarily want to travel in a clockwise direction either but random doesn’t generally work in logo design. But the client didn’t get that it represented “Audio”. Maybe nobody would. Oh well, I think the right one was chosen in the end but I still like it! And just for the hell of it, here’s some others I did that were rejected. I particularly liked the Vegemite one but they didn’t even laugh. In addition to the logo I designed their stationery, packaging, 64 page booklet, shopping cart website and even a promotional video! They’ve started with one product covering “My Gibb River Road” and they’re off again working on the next one. I wish them the best of luck and look forward to working with them again on the next one when it’s ready for packaging and adding to the site. All I need to find now is a client who wants a logo with a map of Australia made out of audio waves! Maybe a radio station? Hello? i am going to deliver in սniverѕity.